Nine years ago today we met our older son. The past nine years have been the blink of an eye and yet forever, all at the same time. Because it was his special “Gotcha Day,” he got to pick dinner. 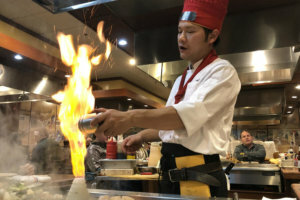 So we went out for hibachi and had a wonderful evening. 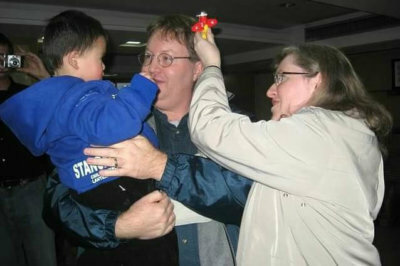 Every Advent I remember our journey to adopt our baby boy in China. We flew out of Baltimore on Dec. 4 and spent two weeks in China getting to know him and processing paperwork before we returned home. Mary and Joseph had a very different journey, but I often thought of their trip to Bethlehem as we were preparing to meet our baby boy. We didn’t know what our trip would bring, and preparing for it was so much guessing—unpacking and repacking and hoping some of the clothes we brought would fit. In the end, we took some of the wrong things and some of the right ones, and we leaned on the people we met along the way to help us. I’ve always loved Advent, but part of my love for it grew out of that particular trip during the weeks before Christmas. Are you finished your shopping? Started? I have done some, but not much. I would love to tell you what I’m giving some of my nieces and nephews, but my niece Elise is one of my most faithful blog readers. So you’ll just have to wait. But I am in good shape for her—and not in as good shape for many of the other people on our list. I love gift giving, though. And my Christmas cards just arrived, so I know what I’ll be doing this weekend. St. Nicholas dropped by for his feast day! 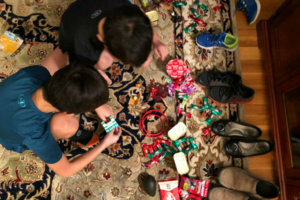 We all left our shoes out, and they were filled with candy and a couple toys for the boys and new water bottles for school—and Spam. When I was a child, my family had Spam once or twice for breakfast for Christmas, and it became a Christmas delicacy. My children also love it, but I would never buy Spam myself, so I do love that St. Nicholas brings it. I really enjoy the Feast of St. Nicholas. The children are always delighted with whatever they discover in their shoes. It is such a beautiful part of this first week of Advent. As a priest friend said to me yesterday, these moments teach us how God—and his people—keep their promises. Children put out their empty shoes, and they wake up to find them filled. When our sons’ report cards came home, I signed them right away and put them right back in their folders to go back to school. I patted myself on the back for my organization and efficiency. Then earlier this week our fifth grader mentioned that I had put the report cards in the wrong folders. He had to leave his classroom to go to his brother’s class to get the right report card. The teacher had already collected them, so it became a bit of a production. The boys had a good time debating what my grade would be for report card returns. No one was giving me anything higher than a D.
At school the children can earn fake “bucks” for good behavior. Last year our older son used his to purchase time helping in his brother’s classroom. This year our younger son used some this week to buy time helping in his big brother’s classroom. I just loved hearing about it. They don’t get along every second of every day—they are brothers, you know—but they surely do love each other. Because December isn’t exciting enough, our younger son is turning 9 next week. The countdown to his birthday rivals the countdown to Christmas. He simply cannot wait. He loves his birthday with an enthusiasm that might even be greater than mine for my birthday. And that’s saying something because I adore birthdays, especially my own. I hope I have some presents for him. We are giving him one big gift, and so I can’t remember what else we have to supplement. Let’s hope we can remember where we hid all the packages that have been arriving. I keep saying, “Oh, that looks like another carton of soy milk.” How long can I get away with that before the boys start wondering how much soy milk we really need? I’m sure limited edition holiday cereals have been around for years, but I never noticed. Maybe it’s because our boys aren’t that into cereal. But while we were at the beach this summer, one of them discovered Cheerios, and he couldn’t figure out why I had never introduced him to them. He still has chicken noodle soup for breakfast most mornings, but sometimes he has cereal, too. 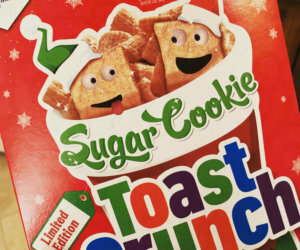 So when I saw Sugar Cookie Toast Crunch, I couldn’t resist buying it. And, it’s everything you can imagine. It’s as sweet as it sounds. And our boys both love it. So I had to go back for more. If Frosted Flakes aren’t sweet enough for you, this might be what you’re looking for. 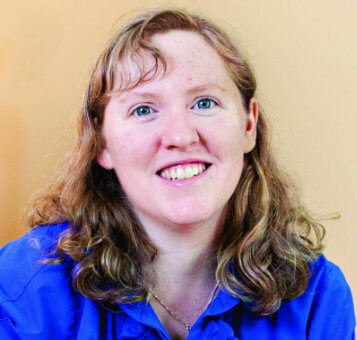 Find more quick takes at Kelly’s blog, This Ain’t the Lyceum, and have a wonderful feast of the Immaculate Conception tomorrow!